The Railway Recruitment Board (RRB) issued a notice regarding recruitment of Level 1, Group D posts (CEN 02/2018) on Sunday that Computer Based Tests (CBT) is probably going to begin from September 17,2018. The RRB board will be going to release the exam city, date and shift details 10 days before the beginning of Computer-Based Tests (CBT). Around 15 million individuals have enrolled for Group C and D employments promoted by the Indian Railways. The Indian Railway board is conducting and presently running CBT of candidates who have applied for the Group C posts of the assistant loco pilot (ALP) and Technicians under CEN 01/2018. Prior to start of Computer Based Test (CBT) exam the candidates can know the exam city, Exam Date and shift details before 10 days and candidates may download the admit card before 5 days and may be candidates can get an option for application status of Level 1, Group D posts (CEN 02/2018) before 10 days at Official website of RRB. 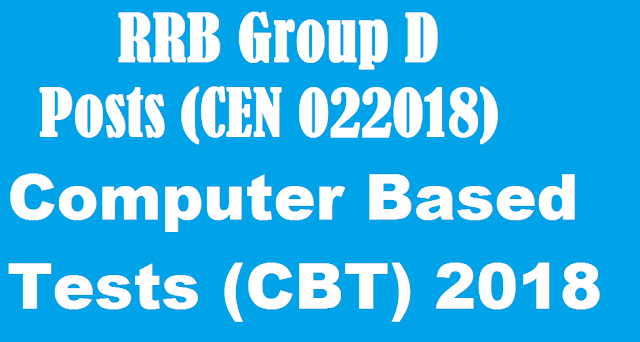 The candidates can download the latest notice regarding Computer-Based Tests (CBT) of recruitment of Level 1, Group D posts (CEN 02/2018) given below link and candidates can get detail updates regularly from this site, Please visit regularly for more update. OSSC Recruitment 2018- Online apply for Latest Post of Inspector of Legal Metrology and other posts. I hope this post very helpful to you and you like very much. Please share this post with your friends on social media and keep a regular visit for more updates.